Here at Epic Adventure Rides, we are proud of this beautiful country we live in and are excited to share it with you through our popular Lake Powell tours. People come from around the world to see this amazing place just to stand in line and feel crowded. Epic Adventure Rides gives you the opportunity to escape the crowds and see some amazing areas in the backcountry of Page, Arizona and Lake Powell that very few have the opportunity to experience. We are passionate about the outdoors and want to share them with you. Still have questions? Here are answers to a list of our most frequently asked questions. If you have other questions or concerns, please feel free to contact us. See you on the trail! How many other people or vehicles will be on our UTV tour? Nobody else will share your tour! It is completely private/exclusive just for your family or group. Have the desert to yourself! 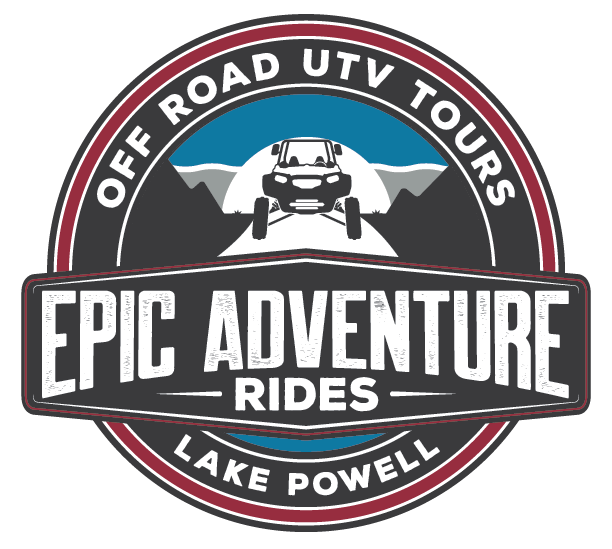 Will we see Lake Powell on our UTV tour? Yes. Our tours do not go near the water at Lake Powell, however we have multiple locations that offer fantastic birds-eye views of Lake Powell. How old do you have to be to drive the UTV? If you want to drive your own UTV, you must be at least 18 with a valid driver license. Guests 16 or older can drive only with a parent or legal guardian as their passenger. What is the minimum age requirement for the UTV tour? We do not have a minimum age requirement, however children must be able to sit safely in a seat-belt and wear a helmet or have a car-seat that extends above the child’s head. Most car-seats can be installed in our UTVs. Do I need to have experience driving a UTV or driving off road? 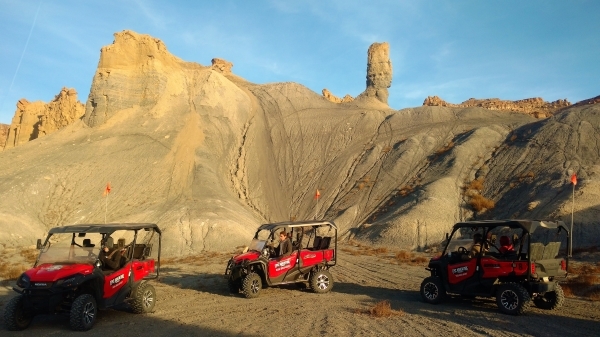 No experience necessary, our UTV’s are very easy to learn and drive. All guests are given a vehicle orientation and a familiarization period driving the UTV. What should I wear for the UTV tour? Closed toe shoes are required, and clothing appropriate for the current weather conditions. You will likely get dusty, we recommend not wearing your Sunday best. An additional layer is recommended in winter to stay warm. Are we required to wear helmets for the UTV tour? Guests under 18 are required by law to wear a helmet. We recommend helmets for all of our guests, but they are not required. Will we get dusty on the UTV tour? Yes. Depending on how recent it has rained will determine how dusty it will be. Goggles and masks are provided free. What happens if there is bad weather the day of our tour? We operate rain or shine, it is part of the adventure! In the event of severe weather with potential risk to the safety of guests and guides we will reschedule or refund. We have a 48 hour cancellation policy to receive a full refund. Cancellations made less than 48 hours are subject to the full price of the tour. Rebooking or rescheduling a tour is free. Do you serve meals during any of the UTV tours? All of our tours include drinks and snacks. Custom arrangements can be made for catering meals, however our standard tours end at lunchtime or start after. We also allow guests to bring along their own food or non-alcoholic beverages, we generally have extra room in our coolers. Are restrooms available for the UTV tour? Restrooms are available at the beginning and end of the tour, “primitive” options are available while on the tour. Will we see any wild animals on the UTV tour? There are many animals in this area, however we can never guarantee you will see a wild animal. Most notable animals in the area: Bighorn Sheep, Antelope, Deer, Mountain Lion, Coyote, Rabbit, Eagles, Hawks, Condors, among others. Can I bring my pet on the UTV tour? Generally, yes. Please contact us before you book to discuss accommodating your pet. What types of payment do you accept for tours? Is it appropriate to tip our guide? Absolutely, your guide works hard to give you the best experience possible. Tipping is not mandatory, but always appreciated.